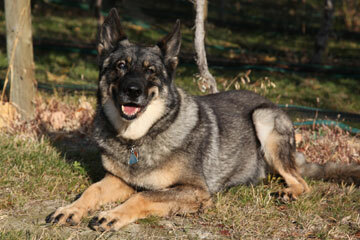 Hi – my name is Lisa and I am the happy human companion of Ela, our gorgeous GSD. Ela came to us from the RCMP Police Dog Training Facility in Innisfail, Alberta where she was a brood dog. Ela is our 2nd brood dog from the RCMP and I was still grieving the loss of our first GSD, Bora, when she came to live in our home. Right from the beginning, Ela was soooo happy to be part of a family. We had some serious issues that first year. The most serious being Ela’s propensity for biting any male visitors to our home. Given that we had 2 young boys (note: she was never ever a threat to children or women), my husband was the Detachment Police Commander, and we’re a very social family, this was a serious issue that we had to eliminate. Thank heavens for the kind and sage help we received from our local RCMP dog handler. With his guidance and the generous cooperation of all male visitors to our home, we were able to change Ela’s perception of men without losing her protective instincts. She is now, 4 yrs later, the most awesome dog. Everyone comments on how alert, friendly and calm she is and how connected she is with me. We live in a rural community with herds of deer everywhere to chase, and she will turn on a dime if she hears me call her; so much so, that now the deer stop running, too, when they hear me call her back. This picture is of Ela relaxing in our vineyard on grape-picking day. She turned 8 yrs old that day. Ela is proof that you need to commit to your pet and work to understand what is going on for them – Ela only wants to please me, so my job is to ensure she understands what we expect from her. I am so very happy that we never gave up on her. Join in and write your own page! It's easy to do. How? Simply click here to return to Sable GSD.